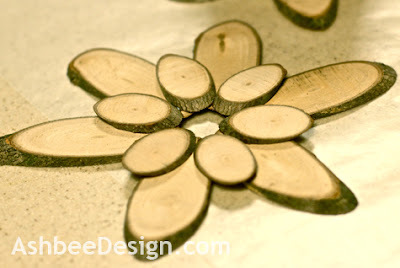 Yesterday I shared with you my new, larger more varied and complex wood slice flowers. 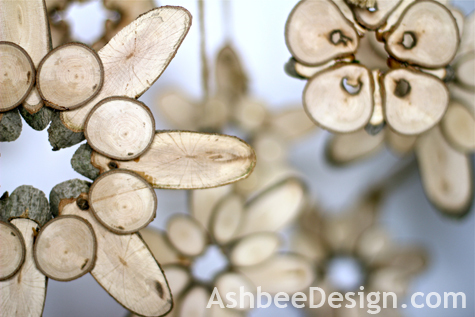 I did take photos as I created these to share with you. They really were simple to create and I made a variety in half the afternoon. A selection of dry branches 1-2" in diameter. Mine came from branches that came down during a storm last year. 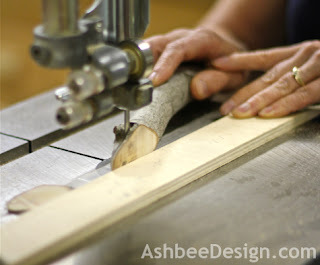 Drill bit - about 3/16"
Set up a guide fence on the band saw to guide you in slicing many wood disks about 1/8" thick. Actual thickness doesn't matter but having them the same thickness does. Cut a wide selection at various angles. You create longer ovals by cutting at a sharper angle. The closer to 90º the slice, the rounder the disk will be. For each size cut 6 similar ones for each flower. 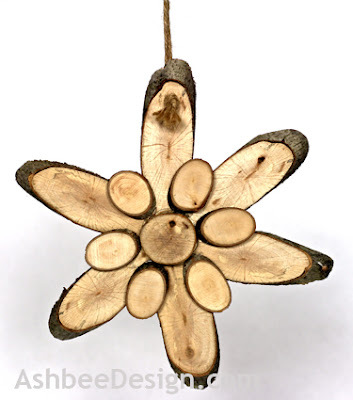 You can cut through areas of knots and if you get 4-6 similar slices they will create interesting and unique flowers. I kept similar ones in sandwich bags for organization (optional). 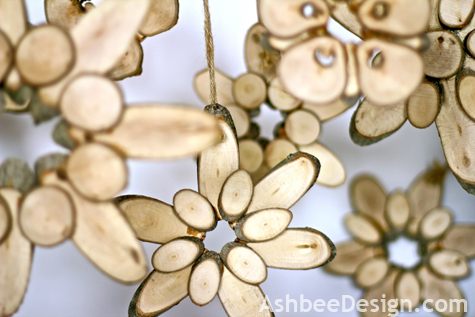 It saved time in matching similar shapes when constructing flowers. Arrange the patterns by playing with the slices. Put 5 or 6 matching ovals together. Then place other pieces on top in a circular pattern making sure that there is adequate overlap to apply glue. 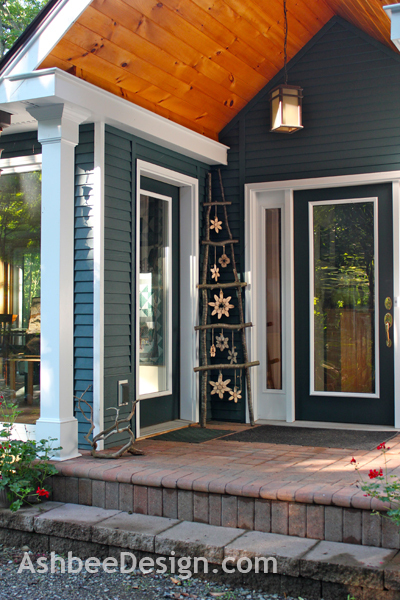 The more overlap, the stronger your design will be. This design has the center open but overlapping side pieces. Remember you can also add pieces to the back for additional strength. 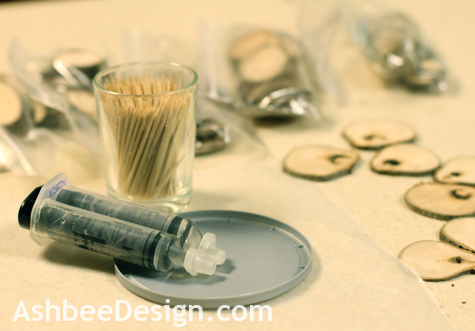 Once you have a design you like, mix up a small batch of 5-minute epoxy. Because it dries quickly you need to be ready to start gluing immediately. I save tops from cream cheese and use them as glue trays. I use a toothpick to mix the small batch of epoxy (about the size of a quarter). 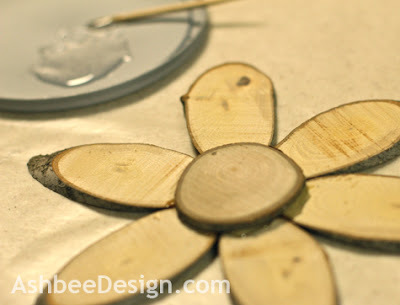 On my original wood slice flowers I used hot glue. That hasn't held up over time so I am experimenting with 5 min epoxy this time round. 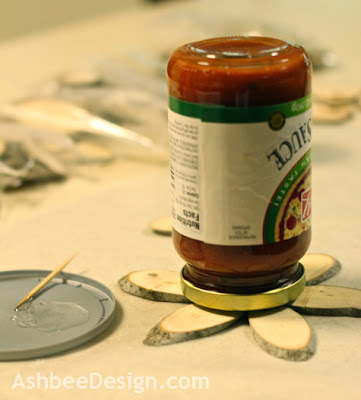 Add a small amount of mixed epoxy to each place that will have disks overlapping. Work quickly. Place the overlapping pieces on the correct area. This design had an overlapping center. 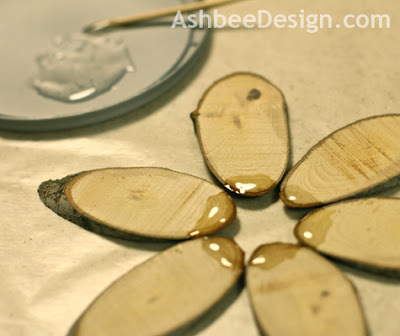 It is best if the wood slices are pressed together while the glue dries. 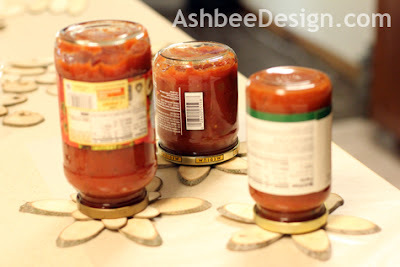 I had little clamps but my husband suggest using jars as anfaster, easier solution. It worked like a charm. I raided my pantry as production continued! Once dry, I drill a 3/16" hole in the top of one of the petals and, using a dental floss threader, threaded a pieces of jute through to hang the ornament from. They look great in groupings! I love these. Thanks for the tutorial! You are welcome. Give it a try and send photos if you do!